We are long time drum corps fans now living in the south. 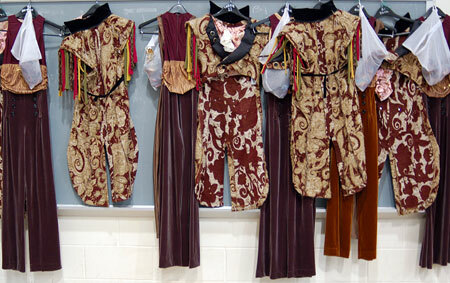 This photo of the Carolina Crown color guard costumes was taken on the morning of July 10, 2008 after the FirstBEAT show in Columbia, S.C. was rained out. We thought that drum corps fans would enjoy seeing a close up of what the well-dressed "mad composers" were wearing this past summer.